Accepting a single wager or payment from a player in a country that has laws restricting Internet gambling can bring significant legal consequences, including frozen assets, monetary fines and even jail time. Leaving your selection of geolocation vendor to chance, or using low cost IP decisioning data can expose your company to unnecessary risks and potential loss of revenue. Many of the largest names in the industry use Neustar IP GeoPoint geolocation data. The most common use of IP geolocation insight for online gaming and gambling sites has been to deny bets (also known as geo-fencing) placed from users in countries where online gambling is not legal. Today, due to the increased scrutiny placed on the gaming industry by regulators, as well as the heightened concerns of gaming company shareholders, simply blocking a user based on their “stated” IP location is not sufficient. You must also be able to determine if a player is trying to hide their actual location by connecting to the Internet via an anonymous proxy or tor network, from a continent that may be thousands of miles away from where they are really located. Online gaming, lottery and sports book sites must be confident that they are using accurate IP geolocation decisioning data to ensure compliance with the conditions of their operators’ license. Without accurate IP insight, not only may you unknowingly allow a player to access your site from a restricted country, but that player may also be part of a larger gambling ring that is accessing your website from a web of anonymous proxies located in a variety of countries. IP Intelligence not only provides you with superior IP geolocation data but it also transforms IP data and behavior patterns to provide insight into non-human activity (e.g. server and botlists). Neustar uses a proprietary global data collection network, curated by a dedicated team of Network Geography Analysts (NGA’s), and patented advanced machine learning algorithms to transform static IP data and internet connections into a global authoritative source of IP decisioning data. This data is what you need to ensure your gaming organization does not run afoul of the restrictions per your operator’s license. 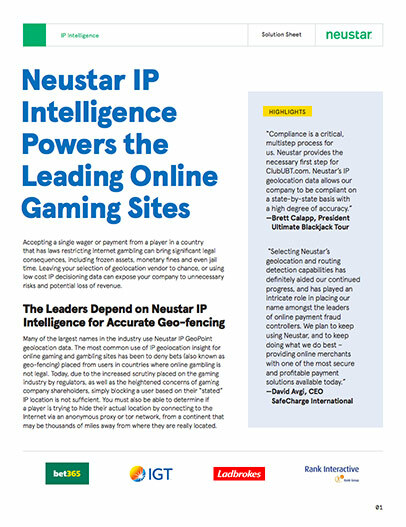 Neustar’s global base of online gaming customers were early adopters, and continue to utilize IP Intelligence decisioning data. For example, Ladbrokes, the world’s biggest bookmaker, was ordered by a Dutch court to prevent domestic gamers from placing bets on its website. Utilizing IP Intelligence data from Neustar, Ladbrokes was able to comply with the ruling by blocking online users from locations inside the Netherlands – a task that was achieved with virtually 100 percent accuracy. When a computer connects to the Internet, it’s assigned an IP address by an Internet Service Provider (ISP). The IP address helps one computer or network device find another computer over a network. An IP address block might be associated with a major Internet backbone, ISP, large enterprise or a public institution. A given network block can then be sub-allocated, sometimes down to the individual IP level, possibly to a location that is different than that found in the registry. Because many organizations operate on a multinational scale, simply using or “scraping” registry information to discern user location is inherently inaccurate. Although registry data should be collected, it is only one part of the equation. Active sensing techniques and human “logic” must also be applied. Neustar continuously monitors the Internet and captures terabytes of data that it feeds into its patented algorithms. This IP data is reviewed for accuracy by its dedicated team of Network Geography Analysts who have a collective 100+ years of domain knowledge and expertise. The data is then transformed into geographic information about the IP address including continent, country, region, state and city and zip. It also provides derived information including representative time zone, postal code (zip+ 4 in the US), latitude/ longitude information, connectivity data, as well as market focused geographic designations including Designated Market Area (DMA) and Metropolitan Statistical Area (MSA). Neustar’s IP Intelligence is an advanced IP geolocation and IP reputation database. With a proprietary global data collection network, curated by a dedicated team of Network Geography Analysts, and patented advanced machine learning algorithms, Neustar transforms static IP data and internet connections into a global authoritative source of IP decisioning data on 99.99% of all routable IP addresses worldwide.